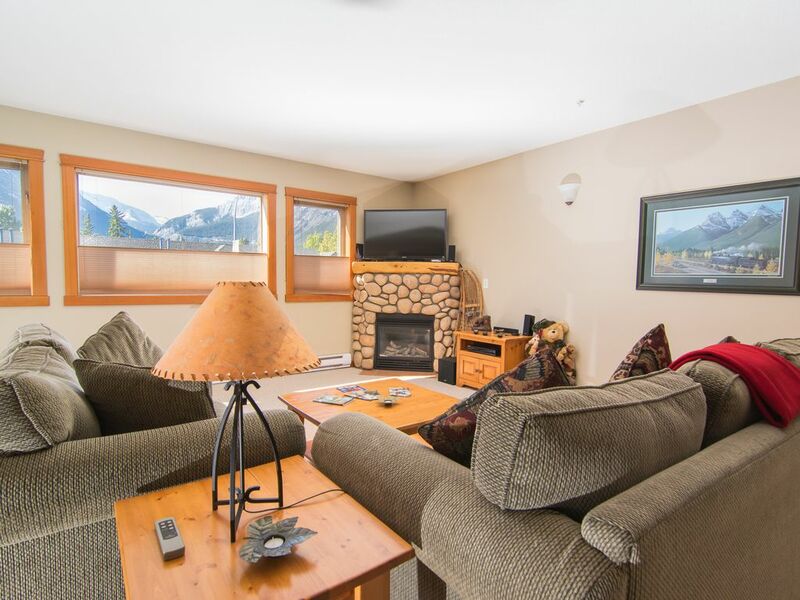 Centrally Located to many amenities including Canmore's Quaint Downtown; Enjoy! This charming, open concept, well equipped, 1228 square feet on one level condo has magnificent mountain views from every room. Heated underground parking by elevator or staircase. A large flat screen TV fills the entire space above the river stone gas fireplace and can be viewed from the dining area, kitchen and living room. Netflix provided and built right into Sony TV Remote; just push the Netflix button and start enjoying your favorite Movies, TV and Documentaries. Short stroll to historic sites, shopping, dining, spas, banks, museums, library, art galleries, World Class Recreational Facility including rock climbing walls and a swimming area that is loaded with family fun filled features. Savour the flavors of several local coffee houses and Starbucks within minutes walk. From the dining room and deck you will feast your eyes on the Iconic Three Sisters Mountain Range; whether you are enjoying your morning coffee or barbecuing on the patio. From the living room you will view the storied Mountains of Miner's Peak, Ha Ling and the Rundell Range that runs for miles into the Banff National Park. When you arrive in our Rocky Mountain home you will find our guest comments book and the words used have made us extremely happy and proud. Our guests have used words and pharases such as; wonderful views of the mountains, awesome location, many fun filled adventures, beautiful setting, loved the train theme, views absolutely breath taking, wonderful space you created, so much effort - made place awesome and many, many more positive comments. Click on the photo tab and as they say; ' A Picture Speaks a 1000 words' Let your eyes enjoy our Rocky Mountain Home. The town of Banff is only 14 miles away and one of the most scenic and enjoyable drives you will ever make. The Town of Banff is world renowned and offers many more additional shops, restaurants, museums, cultural activities and movie theatres. My wife Brendalee and I live in the greater Edmonton, Alberta area. We both have had great careers in the sales and marketing industries. Our fathers were in the Canadian Armed Forces, and we both saw much of Canada as children. I also had the great opportunity to have lived in Europe for four years. As an adult, I have returned on several occasions with Brendalee and other members of our family and friends to Europe. There is nothing like traveling to other countries and seeing how many wonderful sites there are in the world; this is a big part of why we love Canmore, and it's many beautiful settings. We both love the outdoors but are by no means professional athletes; this is an area where any skill level of hiking, biking, skiing, running, walking, golfing, fishing and so many activities can fit your needs. Brendalee and I have surprised ourselves on doing things we never dreamed of until we came to Canmore. We have young grandchildren who we are slowly introducing to all the outdoor activities including skiing and biking. Brendalee has also had her oldest granddaughter learning where the shopping bargains are in the area. We also love music, and Canmore has the oldest Folk Music Festival in Alberta in early August that brings in musical artists from all over the world. We have also been lucky that our children also love the province of Alberta and we get to share our passion for the mountains. We hope you and your families will come and share one of the most remarkable places in the world. Thanks to my job I had the great fortune of working one of the World Cup Mountain Bike races in 1999 as the athletes were readying themselves for the 2000 Summer Olympic Games in Sydney, Australia. The races took place at the Canmore Nordic Centre which was the site of the Biathlon and Cross Country races for the 1988 Calgary Winter Olympics. The Nordic Centre used for many winter and summer World Cup events, and as Canada prepared itself for the Vancouver 2010 Winter Olympics, the Canmore Nordic received an enormous monetary investment to ensure the facilitates remained World Class. There is a mountain bike, cross ski and snowshoe rentals right at the Nordic Centre, and the mountain bike lessons and guides are excellent. Brendalee and I immediately fell in love with Canmore, Alberta and vowed if we had the opportunity to buy a Rocky Mountain home we would. We stumbled upon this unique Vacation Rental Opportunity, and we have had the great pleasure of sharing our Rocky Mountain home with many friends, family, and guests over the years. We have been discovering many fun-filled adventures in Canmore, Banff, Banff National Park, Lake Louise, Kananaskis, and Calgary with family and friends for over a decade. We feel like ambassadors of the area and would be happy to recommend different activities and sites whenever we can. Brendalee and I have traveled throughout most of Europe, the United States, Mexico and the Caribbean and have enjoyed every minute of our trips and believe that your journey to the Canmore area will be marked in your memories as one of the best vacation and recreational spots in the world. What you will find is you will run out of time and will vow to return to continue your Rocky Mountain adventures. This area has so many things to do for whatever leave of proficiency and interest you might have in the great outdoors or if your expertise is shopping and dining the area of Canmore can handle your tastes; something for everyone. Both Bathrooms have heated floors; turn on the switch and enjoy. Stepping out of the shower or bath never felt so good. Low volume flush toilets. Quaint, Unique and Historic with many locally owned business including restaurants, gift shops, clothing shops, coffee shops and so much more. Signature Mountain Views of the Three Sisters, Miner's Peak, Ha Ling, Rundell Range, Cascade Peak, Lady MacDonald, and much more. Electric Base Board Heating in Major Living Area and Bathrooms, Heated Ceramic Tile Flooring in Kitchen and both bathrooms. Gas fireplace has a wall switch to turn on in seconds. You will find extra bath towels in the large bathroom cabinet draws in the main bathroom. Additional sheets and comforters for the hide a beds can be found in the bedroom closets; top shelfs. Free Hi-Speed WiFi Internet 150; name and passcode ​marked in the unit on the modem by the TV and also on the Telephone base. Island in Kitchen has a plugin with 2 USB plugs. Special Oversized Hot Tub Towels; please note in the front entrance way closet. Please ensure you use these towels and not the regular bathroom towels. 4th Floor; Fob Entry System; details in our home; Moutain views; run on the treadmill, stationary bike or Elliptical Machine; you will forget your exercising. Universal Weight Gym and Palates Machine. Gas Fireplace with log mantle with River Rock. Open concept through living, dining and kitchen areas. Large side by side, refrigerator and freezer. Freezer - 1 Tall Basket, 3 Wire Shelves, 4 White fixed bins. Refrigerator Built in Ice Dispenser; cube of crushed ice and filtered water dispenser. Special Spatter Microwave Cover Provided; contains spatter, fits dinner plates and bacon grill plate. Vented design lets steam escape. 4 Slice Toaster; nice to have when the whole family is having your breakfast meal together. This is always a bit of a surprise as guests will leave spices and herbs to give a prepared meal a nice little change in taste. Complete Dish-wear for 6 people including two sizes of drinking glasses, wine glasses and two sizes of coffee/tea mugs. Overlooking the Three Sisters Mountain Range, Miner's Peak and Ha Ling; your visual senses and your taste buds collide capturing many different personal sensations. Tied into the Sony Blue Ray player; full surround sound. 106.5 Mountain FM; local station will keep you informed of the activities happening in Canmore, Banff and the Bow Valley area. Sony Blue Ray tied into stereo system to give you a full surround sound when watching your favourite movie on the BlueRay Player or on NETFLIX. Spectacular mountain vistas in every direction; whether you are sipping your morning coffee or enjoying a glass of wine the views will not disappoint. Multiple golf courses in Canmore, Banff, and the Bow Valley; the Canmore Golf and Curling Club is Canmore's original golf course; each hole has incredible views. Elevator to all floors except rooftop​ hot tub. Fob Entry; Fob details in our home. 2 Roof Top Hot Tubs Outside; one located in our building. Special Hot Tub Towels in the front entrance closet to the condo; please use when ​visiting Hot Tub. Train Theme; various pieces of artwork highlight the Steam Engine Railway days of old and the original establishment of Canmore as a Coal Mining Town and many happy reminders of the Coal Mining History including a scenic hike or walk over the Coal Miner's Bridge that crosses the Bow River. Located in proximity to downtown Canmore, Alberta the gateway to our National Park System including Banff, Yoho, Kootenay and Jasper National Parks. Skate on many of our frozen lakes or waterways; including a short walk to a pond with a Gazebo overlooking the pond to put on your skates. Canmore celebrates New Year's Eve on this pond with Hot Chocolate, Bonfires, and Hot Chocolate; what a treat!! Hike Johnson Canyon, summer or winter with ice cleats. Lake Minnewanka (' Water of the Spirits' in Nadoda) is a glacial lake located in the eastern area of Banff National Park. The lake is the longest lake in the mountain parks of the Canadian Rockies. There are daily boat tours in the summer, and the area is rich in animal life (e.g., elk, mountain sheep, eagles, mule deer, bears) with an excellent chance you will see some of this wildlife from your tour boat. The captain of the tour boats have great stories of the rich history of the are, and there is a good chance you will get to steer the tour boat and get that once in a lifetime photo. Ride to the top of Sulphur Mountain by Gondola or hike to the top and hike down. Hike up to Ha Ling which is one of your mountain views from our condo. Hike to Grassi Lakes; rated #2 Tourist Attraction in Canmore. Two small lakes located right in the mountains. The colour of the lakes sparkle; two incredible gems in the Rockies. Horseback riding with several stables in the area that can handle all abilities. Waterwater rafting available in the Bow Valley for all different abilities. Walk on an ancient glacier; Icefield Parkway. Elevation Place; world-class recreational centre; less than 5-minute walk from the condo. You will never get the kids to leave.